Madge and Basil Lambert reflect on almost eighty years together, and share some of the music that takes them back to the 1940s. In 1944, twenty year old Madge Lambert stepped on a troopship bound for Chittagong in Burma, thousands of miles away from her home and family. Only recently qualified as a nurse, Madge had signed up to serve in the Burma campaign; and stationed near the frontline, she worked long and exhausting hours nursing the badly-injured soldiers in her care, finding strength in the company of other nurses. Some Sunny Day is the story Madge's long distance romance with Captain Basil Lambert, and of their courage and sacrifice. In this piece, Madge and Basil reflect on almost eighty years together, and share some of the music that takes them back to the 1940s. I still cannot believe that my first meeting with Madge ever took place, due to sudden movements of Allied forces – at any time - in the war zone, and later that our feelings for each other continued following my posting to Rangoon in 1945, and for the next 18 months, until we met again in 1947 at my parents home in Woking. My biggest thrill was being able to talk to her from Rangoon to Chittagong via Imphal, through the kindness of my friends in the Royal Signals field telephone system – a distance of well over 1,000 miles - and lasted some 3 to 4 minutes before they had to cut us off. Following our marriage in 1948, Madge presented me with two lovely and beautiful daughters, Carolyn and Angela, who – after nearly 80 wonderful years together and now in the Nonagenarian period of our lives – are making sure we continue to enjoy our remaining years. We are very lucky to have had such a long and happy marriage. Any problems or misunderstandings have usually been dealt with amicably – a bit of give and take there! A few quite serious health problems, but St Richard’s is wonderful hospital, and the doctors and staff, as well as the Medical Centre who put us on the right road. We have been going to the Westgate Leisure Centre as often as possible over the past 15 years. Basil usually swims 800 metres in the pool, or works harder in the gym, and I do Circuit training – cycling, rowing, Step-ups and stretching etc- with the guidance of Tina, our long suffering Instructor, followed by a very welcome cup-of-tea with the friends we have made at these social gatherings. At our age these exercises keep us on our toes and enabling us to continue to lead the enjoyable and lovely life of the many years we have spent together. 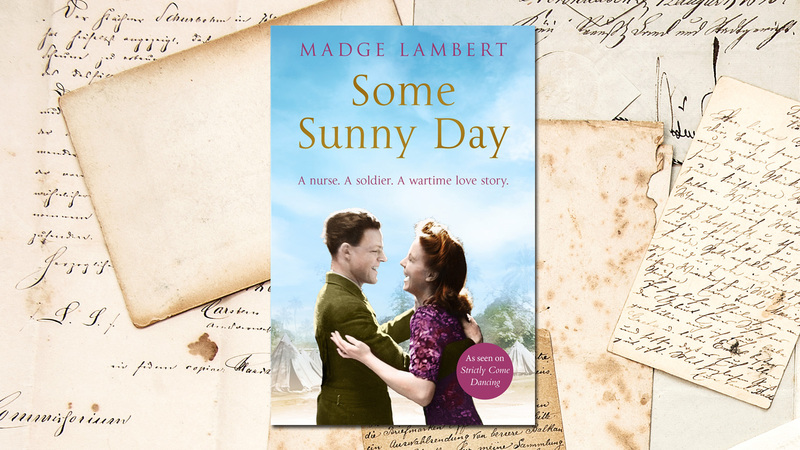 Some Sunny Day tells the wartime love story of Madge and Basil Lambert, who after meeting on the frontline in Burma in 1944, have been married for eighty years and appeared on Strictly Come Dancing. Some Sunny Day is published in hardback and ebook and is available now.